Drew Holladay, Assistant Professor of English, joined the faculty at UMBC in 2017 after completing his doctorate at the University of Louisville. He has presented at numerous national and regional conferences, including the Conference on College Composition and Communication and the Rhetoric Society of America biennial conference, and his writing has been published in Technical Communication Quarterly and JAC. Dr. Holladay’s research combines rhetorical theory, disability studies, sociolinguistics, and digital humanities to examine writing about medicine, the brain, and mental health. His dissertation focused on informal writing within online mental health discussion boards, where he investigated the strategies people use to argue and advocate for appropriate medical support and improved public understanding of their mental disabilities. Throughout his work, Dr. Holladay studies the effect of an increasingly potent biomedical ideology on discourses of mental health–how biological explanations of brain function and behavior are taken up in psychiatric and psychological research as well as arguments in the legal and criminal justice systems, educational institutions, and government policies. 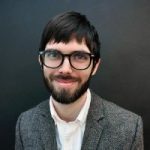 He is also interested in the use of corpus linguistics to study the appearance of medical terms in popular discourse and science journalism. Holladay, Drew. “Classified Conversations: Psychiatry and Tactical Technical Communication in Online Spaces.” Technical Communication Quarterly, vol. 26, no. 1, 2017, pp. 8-24. Holladay, Drew. “Responsivity and Unity in Rhetoric and Composition.” Response essay. JAC: A Journal of Rhetoric, Culture, and Politics, vol. 34, no. 1-2, 2014, pp. 239-245.